In January this year, the IEEE Signal Processing Magazine contained an article by Erik G. Larsson, Danyo Danev, Mikael Olofsson, and Simon Sörman on “Teaching the Principles of Massive MIMO: Exploring reciprocity-based multiuser MIMO beamforming using acoustic waves“. It describes an exciting approach to teach the basics of Massive MIMO communication by implementing the system acoustically, using loudspeaker elements instead of antennas. The fifth-year engineering students at Linköping University have performed such implementations in 2014, 2015, and 2016, in the form of a conceive-design-implement-operate (CDIO) project. The article details the teaching principles and experiences that the teachers and students had from the 2015 edition of the CDIO-project. This was also described in a previous blog post. In the following video, the students describe and demonstrate the end-result of the 2016 edition of the project. The acoustic testbed is now truly massive, since 64 loudspeakers were used. I regularly get the question “are there any Massive MIMO books?”. So far my answer has always been “no”, but now I can finally give a positive answer. 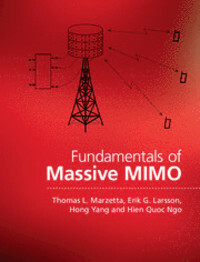 My colleagues Erik G. Larsson and Hien Quoc Ngo have written a book entitled “Fundamentals of Massive MIMO” together with Thomas L. Marzetta and Hong Yang at Bell Labs, Nokia. The book is published this October/November by Cambridge University Press. I have read the book and I think it serves as an excellent introduction to the topic. 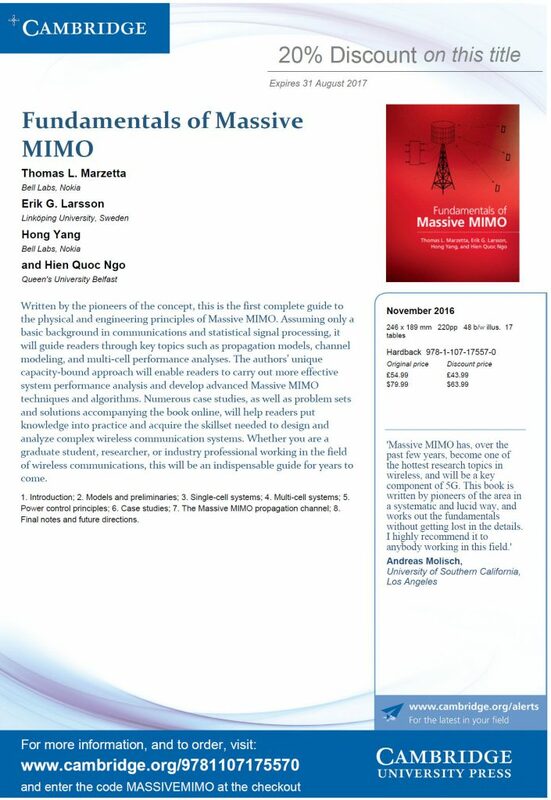 The text is suitable for graduate students, practicing engineers, professors, and doctoral students who would like to learn the basic Massive MIMO concept, results and properties. It also provides a clean introduction to the theoretical tools that are suitable for analyzing the Massive MIMO performance. I personally intend to use this book as course material for a Master level course on Multiple-antenna communications next year. I recommend other teachers to also consider this possibility! Update: Since November 2017, there is another book: “Massive MIMO Networks: Spectral, Energy, and Hardware Efficiency“.